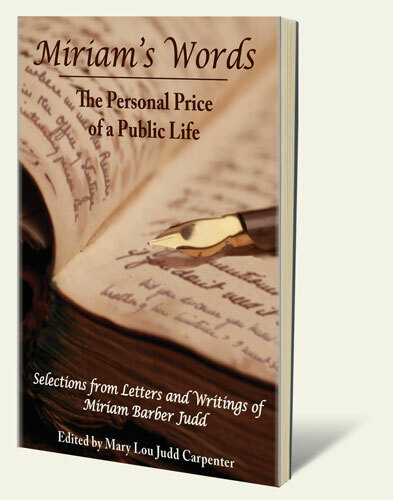 Miriam’s Words, an in-depth, real-time account of the life of the spouse of a public servant in the midtwentieth century, is a collection of letters written by Miriam Judd, wife of Dr. Walter Judd. The original collection included some 2,000 letters, and was compiled and edited by Mary Lou Judd Carpenter, the daughter of the writer. If you’d like to find out more about Miriam’s Words, you’ve come to the right place. Visit the Story section to find additional letters, excerpts and images that were not included in the book. Visit the Events page to find out where Mary Lou will be speaking or where you can find out more about Miriam’s Words. In the Media section, you will find both the press kit and links to media mentions related to the book. You can buy the book in paperback or ebook format. Contact us if you have any questions or comments, or if you would like to have Mary Lou visit your group or participate in your programming.